Since 78% of Australians over 14 years old drink alcohol, recent research that has found that “even moderate drinking” could “damage the brain” is frightening. Research has shown that 17% of Australians drink alcohol at levels that make them candidates for long-term harm such as diabetes, liver disease, and cognitive issues. Also, heavy drinking over ten years and beyond can cause significant cognitive disorders like Korsakoff’s Syndrome and Wernicke’s Encephalopathy, where memory, thinking functions, and motor coordination are severely damaged. But what about having two to three drinks a day? An observational study found an association between moderate drinking and brain damage, not a causation. The study tracked people over a long period of time, finding a connection between their alcohol intake and particular cognitive functions. Researchers from the University of Oxford and University College London conducted the study, published in the respected journal The BMJ, which followed 550 men and women for 30 years who were not alcohol-dependent. Light: consumed between one and seven drinks a week. Moderate: drinkers had between seven and 14 drinks a week for women, and between seven and 21 drinks for men. Unsafe: men who had 21 or more drinks per week, and women who drank 14 or more, were classified as “unsafe” drinkers. 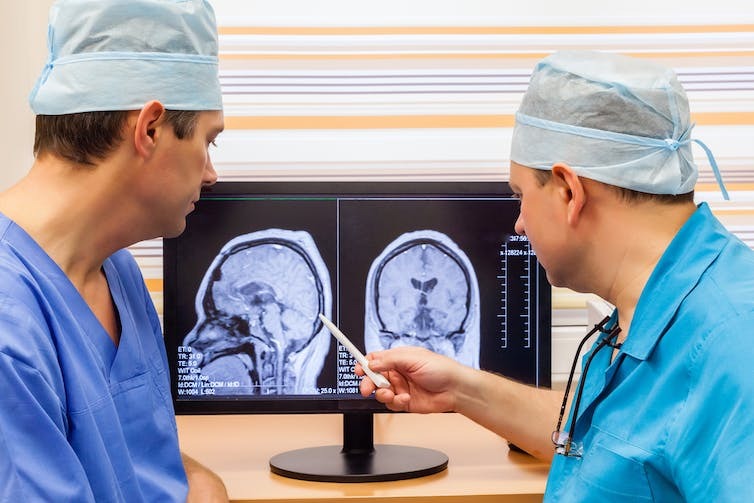 Participants were given a brain scan once at the 30-year point and neuropsychological testing five times during the 30 years. And while alcohol can potentially affect multiple parts of the brain, the researchers found significant impact in only one part of the brain. And that did not appear to correlate with poorer brain functioning overall. The main difference between the drinking groups was that people who drank more tended to have a smaller hippocampus, which is the region of the brain that is vital for learning, memory and spatial awareness. 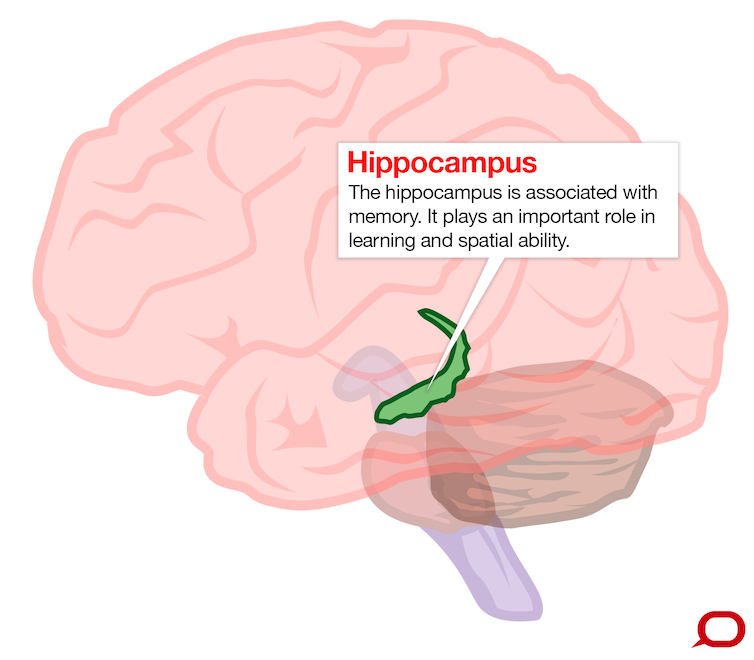 This smaller hippocampus was found in people who drank an average 30 or more drinks a week and even those drinking between 14 and 21 drinks a week. 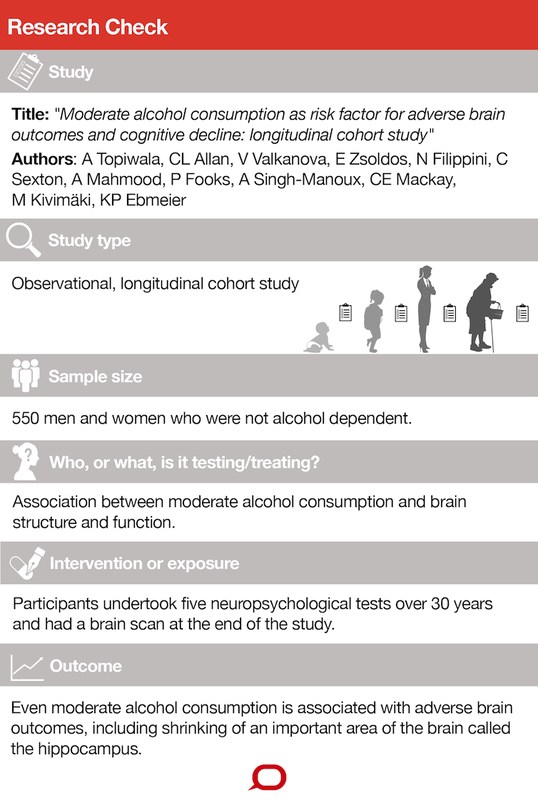 Observational studies aren't able to prove that alcohol caused the impaired brain function. There are other individual factors that make a person suffer from cognitive problems along with alcohol intake like age, gender, mental health problems and drug use. The Australian National Health and Medical Research Council recommends that adult men and women should drink no more than two standard drinks a day to maintain long-term health and a maximum of four drinks during one occasion to avoid short-term harm. I'm having difficulty running this rewrite, not because you didn't write it well, but because I understand that topics like these need further analysis to be able to clearly interpret the data given and present it in a way that would be understandable to the kind of readers we have. You see, the conclusion of this research is basically this: there is a correlation between moderate alcohol intake and brain damage, but (1) the link has yet to be strongly established; (2) the only "damage" there is is that the hippocampus is smaller among those who drink -- doesn't matter if they drink heavily or lightly; and (3) there is nothing suggesting that alcohol can harm brain function. At most, it can lead to a deterioration of verbal fluency, but that's all. If you can rewrite this article with the aim to substantiate the three findings of the research conducted, then that would be so much better. The info you need is already in the original article and its graphics.